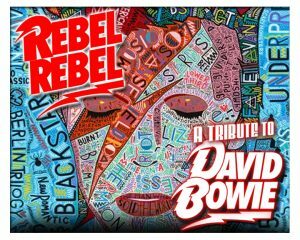 Rebel Rebel is a David Bowie tribute band faithfully recreating the most popular songs from Bowie’s extensive back catalogue. The band themselves are fans and have a deep respect for the man and his music. The set for this show is built on Bowie’s most loved and enduring songs and the band have worked hard at re- creating the sound and look of a David Bowie concert. Lead singer Peter Quinn has always had his voice compared to Bowie’s. “I released and album of original material and it was instantly compared to Bowie. It was something I had been told from the time I recorded my first demo tape, so when I was looking for a new project a Bowie tribute was the obvious direction.